GALION — The Galion Health Department will continue mosquito control activities in the community this year, using grant funds from the Ohio Environmental Protection Agency. The Ohio EPA grant program helps local agencies to protect human health from potential mosquito-borne diseases. 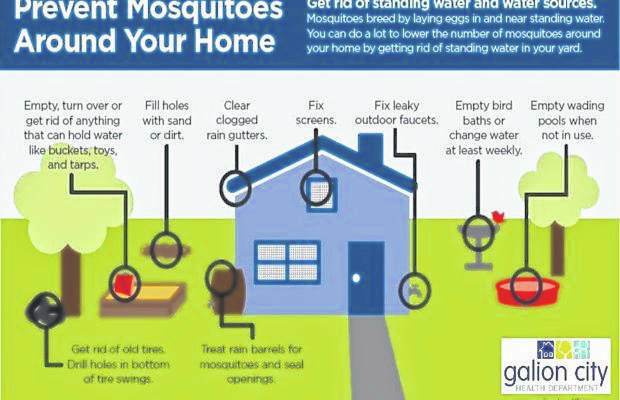 From May through October, mosquito surveillance will be conducted by trapping and testing adult mosquitoes for disease such as Zika and West Nile. Traps will be placed in each city park and near standing bodies of water. Residents are asked not to tamper with these traps. The health department set traps in 2017, too. The number of mosquitoes that tested positive for West Nile Virus was six, out of 50 pooled samples tested by the Ohio Department of Health. This summer, the city will spray for adult mosquitoes based on results of the surveillance program, which also helps determine high-volume breeding areas for mosquitoes. Residents can help reduce the mosquito population near their homes by removing trash, other waste, and old tires from their yard. This year’s Community Clean Up Day is scheduled for Saturday, June 9. Dumpsters will be available in the parking lot across from the Fire Department. As part of the grant from the Ohio EPA, tires — a huge breeding ground for mosquitoes — will be accepted.